“…As free as the wind blows” – Happily After Retirement! My sister lives high on a hill in Ireland. When the wind blows, there is no escaping it. She has to go inside or let it toss her around. She’s toying with the idea of getting a windmill for her yard so she can take advantage of the wind by reducing her electric bill. 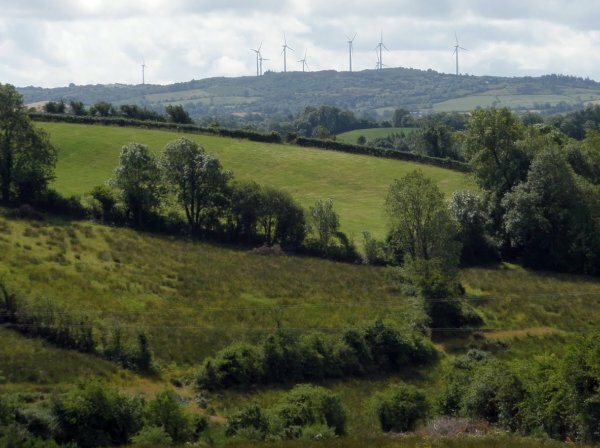 Windmills are a common sight on the hills in Ireland. You can look up and see hundreds of them churning away when the wind is blowing. In the US, wind farms are popping up and making their mark, too. The governor of Colorado is in favor of wind energy and has tossed out green incentives to encourage this alternative. Vestas Wind Systems has moved to Colorado and will employ almost 2000 people in 4 different communities. Wyoming is also an excellent place to generate electricity because there is a dip in the Continental Divide and the wind blasts are the highest in the country. Wyoming’s population is about 500,000 people which mean there are millions of acres of open space for wind turbines. Cities and towns on the east and west coasts are jumping on board to harness wind and turn it into cash. Now, I’ve taken it upon myself to do some research and give my sister the pros and cons of having a windmill on her property. She will hear a ‘ka-ching’ each time the blades rotate and power is created. As the cost of electricity rises, her bill will go down and she will probably make money. Wind is clean, renewable power. Wind is a free resource. You may not mind having a windmill in your backyard; however you must consider how many others in the area will be affected. Some neighbors have complained about headaches, nausea and anxiety because of the constant noise. Another drawback to owning your own windmill is the sound is attractive to birds that tend to fly into the blades. If you ever visit a wind farm, take a walk along the base and see how many lifeless birds are strewn about. Do you want that in your yard or in your neighbor’s? As the wind ebbs and flows, the sound varies. Sometimes it sounds like a washing machine, sometimes like a train and other times like a low flying airplane. The sweet sounds of a windy evening have been drastically altered. The land area is much larger than the base of the generator. A windmill can be over 5 stories tall, affect cell phones and cause electrical shortages when the turbines start up (after the wind dies down). Whether ‘tis nobler in the mind to suffer the slings and arrows of outrageous fortune …?